It's impossible to match the 1991 animated classic, but the live-action remake at least does it justice. WASHINGTON — When Disney first announced the plan to remake its animated classics as live-action flicks, many folks were initially (understandably) skeptical. Instead, the annual spring rollout has become one of the most pleasantly reliable trends out of Hollywood, from Angelina Jolie in Robert Stromberg’s “Maleficent” (2014) to Cate Blanchett in Kenneth Branagh’s “Cinderella” (2015) to Idris Elba in Jon Favreau’s “The Jungle Book” (2016). Now, Disney attempts its toughest task yet by reviving the greatest animated musical ever created: “Beauty and the Beast” (1991), the Golden Globe winner for Best Picture: Comedy/Musical and the only animated movie ever nominated for a Best Picture Oscar in an elite field of just five nominees. Once again, we meet Belle (Emma Watson), a book-loving dreamer living with her father Maurice (Kevin Kline) in the French countryside (“Little town, it’s a quiet village”). Dodging the unwanted advances of the town brute Gaston (Luke Evans), Belle escapes her provincial life in a Gothic castle, where she selflessly swaps places with her father to become captive to a gruff Beast (Dan Stevens). As we all know, the Beast was once a handsome prince before a secret enchantress punished him for his vanity, cursing him to remain transformed — along with his house servants — until he can achieve true love. 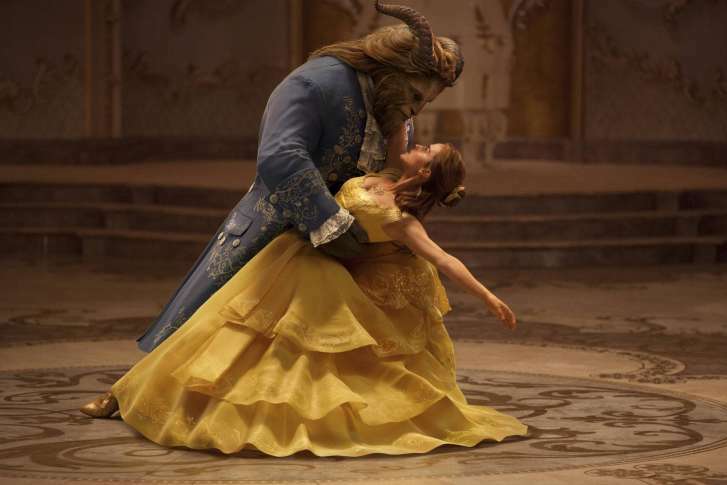 Can Belle and the Beast fall in love in time to break the spell before the last petal falls? While it’s impossible to match the 1991 animated classic, this loving live-action tribute at least does the film justice. It’s smart enough to never stray too far from our beloved elements, while taking occasional risks to provide “something there that wasn’t there before.” For instance, it answers a question that’s plagued fans for years: How did Belle become an only child living with her father? If you’re a Disney purist who opposes such amendments, try to remember that the 1991 version was itself a remake of Jean Cocteau’s French film masterpiece “Beauty and the Beast” (1946), which turned teardrops into diamonds and Gaston into a Beast. In truth, the fairy tale is old as time — or at least 1740 when it was first published by French novelist Gabrielle-Suzanne Barbot de Villeneuve. In 2017, the story means new things to new people, so it’s time for a new generation to explore it. Emma Watson is a no-brainer for this demographic, earning a special affection with audiences after watching her grow up before our eyes as Hermione Granger in the “Harry Potter” series. As Belle, she looks the part and acts it quite well, mining father-daughter emotion with the stellar Kevin Kline. However, Watson’s singing voice sounds a little too perfect, boasting an artificial, autotune sheen that sounds noticeably different from the rest of the cast. Did the filmmakers try a little “Disney magic” with digital enhancements? It sounds even more odd after the other Emma — Emma Stone — sang with a raw vulnerability in “La La Land” and was rewarded with a Best Actress Oscar just weeks ago. Like the sage advice goes: Don’t let the perfect become the enemy of the good. Unless, of course, you’re Paige O’Hara, whose voice was pitch-perfect as Belle in 1991 (Check out our chat with O’Hara here). Not to worry, the autotune Belle isn’t too distracting, thanks in part to Watson’s genuine chemistry with The Beast, played impressively by Dan Stevens, who can really belt to the rafters. Best known as Matthew Crawley in PBS’ “Downton Abbey,” Stevens uses motion-capture technology to show actual facial expressions beneath his furry CGI exterior, which comes complete with horns, claws and teeth. The special effects are also superb for Beast’s servants, doomed to exist as inanimate objects. Ewan McGregor is charming as candelabra Lumiere, Ian McKellen is strict as clock Cogsworth, Emma Thompson is bubbly as teapot Mrs. Potts, Nathan Mack is adorable as Chip, Audra McDonald is boisterous as wardrobe Madame Garderobe, Stanley Tucci is lonely as piano Maestro Cadenza, and Gugu Mbatha-Raw is playful as feather-duster Plumette. They’ll make you crack up, then well up. Still, the best performances belong to the antagonists. Luke Evans, who played the villain Shaw in “The Fast & The Furious,” is perfectly cocky as Gaston, while Josh Gad is hilarious as LeFou, reviving the same lovable doofus charm he brought to his originating role as Elder Cunningham in Broadway’s “The Book of Mormon” before voicing the singalong snowman Olaf in the Disney hit “Frozen” (2013). Fittingly, it’s Rice who reunites with Menken again here, offering new songs that didn’t appear in the 1991 animation. Some are rather average, such as Belle’s “Days in the Sun,” which feels forced with exposition as she claims her character is growing. Others are welcomed additions, such as “How Does a Moment Last Forever,” first sang intimately by Kevin Kline at a music box, then wonderfully reprised by Watson in Act Two, before getting the Celine Dion pop-ballad treatment during the end credits. Best of these new additions is Beast’s haunting song of longing, “Evermore,” which arrives just before the “Kill the Beast” climax. Stevens will give you chills (“Phantom of the Opera”-style) as he sings the line, “Now I know she’ll never leave me!” Dare I say he rivals Josh Groban’s cover on the soundtrack? All right, all right, who are we kidding? No one’s coming to see this movie for the new songs. We’re coming to see how they pull off the classic tunes we know and love! Here, the film doesn’t disappoint, thanks to the steady hand of Oscar-winning director Bill Condon (“Gods and Monsters”), who proves he’s the right filmmaker for the job after penning “Chicago” (2002) and directing “Dreamgirls” (2006). Condon creates a lively tapestry from the townspeople in “Belle,” which has always been the most “musical” of all the Disney songs with its overlapping shouts of “Bonjour!” It might have been even better if shot in a daring single-take, the camera weaving through the stores, libraries and bakeries. As expected, Condon saves his more gutsy techniques for “Be Our Guest,” a dazzling number where the food, plates and silverware form kaleidoscopic images in the style of a Busby Berkeley musical — just like the 1991 animation — all backed by the mesmerizing “Moulin Rouge” pipes of McGregor. It all builds to the moment of truth, the title number “Beauty and the Beast,” where Condon delivers a nostalgic crane shot from the ballroom chandelier to find Watson sparkling in her gold dress for a wonderful waltz. Of course, you’ll miss Angela Lansbury’s golden voice singing the legendary song, but Emma Thompson gives a valiant effort as Alan Menken’s violins register timeless goose bumps. Yes, the future remains bright for Disney’s live-action remakes, leaving fans excited for Guy Ritchie to direct the live-action “Aladdin” and Favreau to direct Donald Glover in the live-action “Lion King.” If you expect something new, don’t get your hopes up. But if you love reveling in nostalgia, be our guest.